VGV: I grew up hearing stories about my grandfather, Guy T. Viskniskki. He was the founder of The Stars and Stripes, the newspaper of our armed forces. Guy was lost to history in that he was only mentioned in passing yet he was the motivating force behind The Stars and Stripes. His story needed to be told. VGV: This book is special for a number of reasons. First of all, it describes how my grandfather got The Stars and Stripes up and running in wartime France, 1918. Not a small accomplishment. Second, the book gives some of my family history so that I know it will be passed down to my grandchildren. Third, it is probably the only book I will ever write. It was a long process and I am not sure I want to go through it again on another subject. VGV: I think people must read Unsung Patriot because it will help them to understand the true nature of The Stars and Stripes. Guy fought for the principles that the paper should be “By and for the soldiers”. There were many people who tried to intervene and get the army top brass to oversee the newspaper but Guy was successful in fighting them all. The newspaper today still follows those principles: By and for the soldiers. It is truly their newspaper. VGV: People who do not believe in what our armed forces are doing should read this book. That way they will learn that The Stars and Stripes is truly the soldiers’ newspaper. And then they can go read the paper – it’s available online – and see what the soldiers are actually thinking about their job in the Middle East. VGV: Actually, I don’t think of myself as really being creative, in the sense that I cannot write fiction or tell good stories. That said, long walks in the woods with my dogs really seem to help. Many times something is kicking around in my head and getting out in the fresh air and walking seems to get things in place. Maybe it’s just getting away from the typewriter. I would suggest anything that makes a person feel refreshed and rejuvenated might help to spark creativity. VGV: The biggest stumbling block was making the decision to actually write Guy’s story. And the second biggest was actually starting to do it. I would suggest that anyone who wants to write just sit down and do. Don’t worry about whether it’s good or not. Just write to please yourself and maybe one other person. I think that makes the project less daunting. What do you think motivates people to become authors? What motivated you to get into this unusual activity? VGV: From my experience talking to various authors, it appears that many of them feel that they have a special story to tell. I certainly felt that way. Some authors also seem to need the praise and attention of being a writer. Others have always wanted to write and it just seems like a natural outgrowth of their personalities. What motivated me? 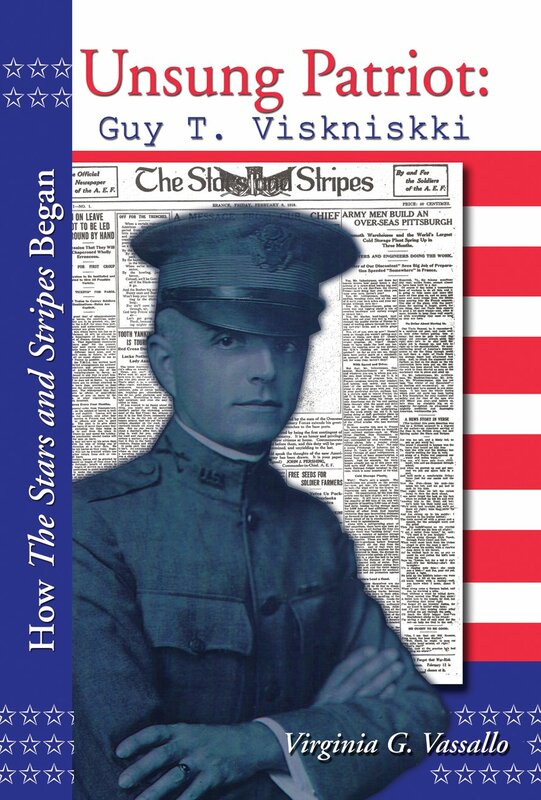 I knew that I was one of two people who could write the story of Guy T. Viskniskki and The Stars and Stripes because there were only two of us who had his memoirs. Since I have a love of history, it just seemed natural that I should gather the information and write Unsung Patriot. I also wanted to make sure that the family stories that are included in the book were passed down to my grandchildren. VGV: My first thought is that my husband, Russ, and I went to a two day gun show to sell our books. And surprisingly enough, we did sell quite a few. When we go out to dinner, very often I sell a book or two to our waitress. We just start talking and I start selling. Russ kids me that there is a Wanted Poster up in Lexington, KY, with my name on it: Beware this person will sell you a book. VGV: I am Guy T. Viskniskki’s granddaughter. I inherited his 435 page memoirs of his year he spent in France trying to get The Stars and Stripes up and going. I grew up next door to his widow who told me many family stories. Those are the three top reasons why I am the best person to write this book. I can do justice to how The Stars and Stripes began because I do have much of the research materials present in my home, having inherited all the family papers when my mom died. I was also a history major in college so I learned how to write extensive research papers and still make them interesting. And as an attorney I did a considerable amount of writing. If a potential reader thinks that your book wouldn’t interest them, what would you say to convince them to buy? I’m thinking something better than “It’s the greatest book ever.” Give me something more specific. VGV: If you like history, this is a book that will interest you. If you are afraid that reading history is boring and technical, that is not true of Unsung Patriot. If you like genealogy, please read this book as you can learn how to write your own family history. If you want to understand the true concepts behind The Stars and Stripes, this is the book for you. VGV: Since Unsung Patriot is about my grandfather, I think it is pretty obvious why the topic interests me. The book should interest potential readers because it will help them understand what our troops today would be facing if they did not have a newspaper of their own – one they could count on to tell them the truth. My lack of creativity is a problem when trying to come up with a hook. Help! Is there a way to tie your book topic to current events? If so, tell us about how you could do that. I have a blog to feature information and examples of tying books into current events that might be a good place for you to promote your book. VGV: Yes, there is. Since our troops are scattered about the globe, one of the means of creating unity among the units is The Stars and Stripes, the newspaper of our armed forces. Unsung Patriot tells the story of how the newspaper began. I think people would be interested to learn the details of how the paper almost didn’t get started – all the problems entailed in starting a newspaper in a war torn country. I am very proud to be the granddaughter of the founder of the paper and I am extremely proud that his guiding principles are still guiding principles of The Stars and Stripes today, ninety years after my grandfather started the paper. VGV: Please visit our websites: www.krazyduck.com and www.unsungpatriot.com. Please feel free to contact us at Russ@krazyduck.com. k you for visiting with me and in closing, give us your website.